Photos by Dennis Dean, videos by Dennis Dean and Asia Morris. 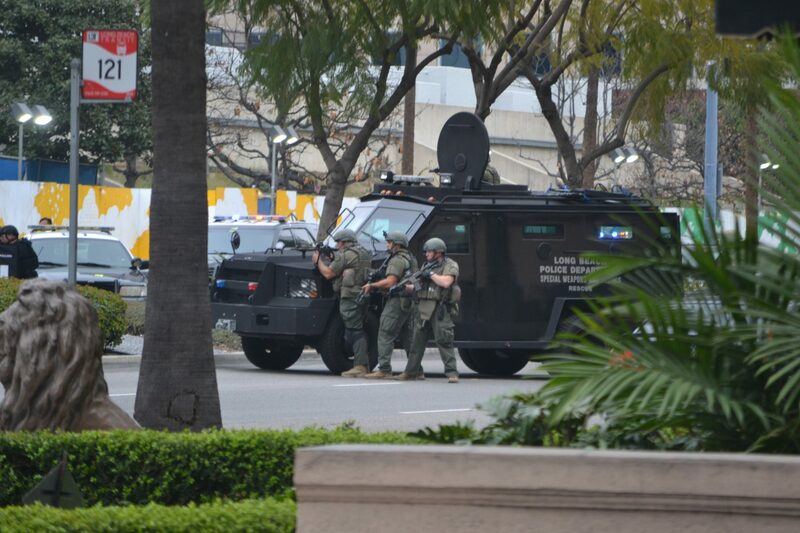 UPDATE | An armed man who allegedly threatened to blow up a federal building in downtown Long Beach before being fatally shot by police after a two-hour standoff Wednesday night was identified as an Oregon man, authorities revealed this evening. Donald McFarlane, 53, was transported to a local hospital where he later died after police shot him in front of Long Beach City Hall at about 6:00PM. McFarlane’s motives are still under investigation, according to police. Authorities said SWAT initiated a tactical plan at that time based on the suspect’s “demeanor and movements.” They first shot 40mm rubber baton rounds and gas at the suspect before shooting at him when he “pointed the handgun at SWAT officers.” A police dog was also deployed. An airsoft pistol was recovered at the scene. During the incident, officials said McFarlane claimed explosives were inside his vehicle, a white Ford van—originally reported by police as a Chevy van—but the Los Angeles County Sheriff’s Department bomb squad found none inside. During a follow-up investigation police linked two other residences to the suspect, a location on the 600 block of Elm Avenue in Long Beach and another on the 18000 block of Tulsa Street in Granada Hills. Anyone with information regarding this incident is urged to call Homicide Detectives at (562) 570-7244. 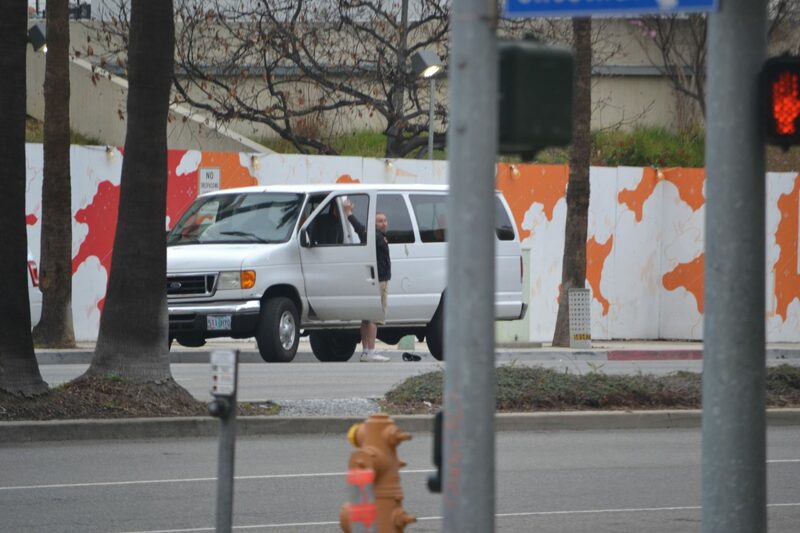 Anonymous tips may be submitted through “LA Crime Stoppers” by calling 1-800-222-TIPS (8477). 03/07/18 | 23:43 | The Long Beach Police Department has confirmed that the suspect in tonight’s armed standoff on Ocean Blvd. near Long Beach City Hall has died at a local hospital as a result of injuries sustained during the officer-involved shooting. More information to come. 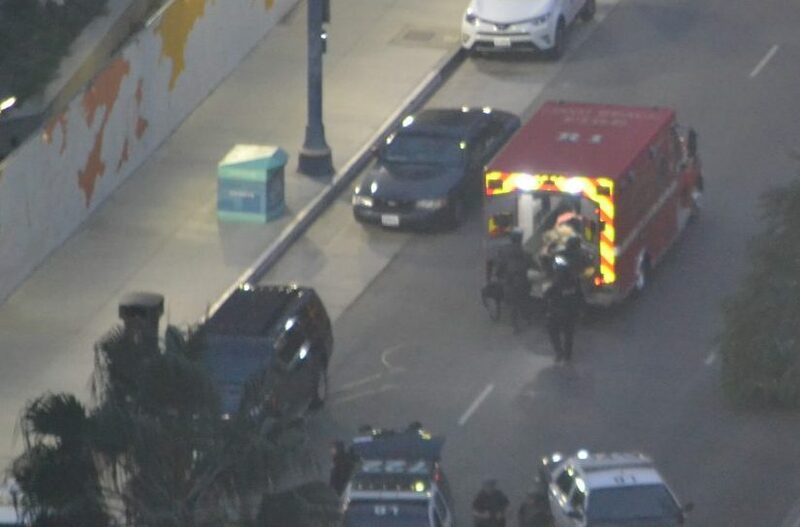 03/07/18 | 18:47 | A standoff outside Long Beach City Hall between police and an armed man ended in gunfire Wednesday evening, when the suspect was shot by law enforcement officers. At about 3:55PM Long Beach police were dispatched to the area of Long Beach Boulevard and 4th Street in response to a call from a “hysterical” woman saying her husband was armed with a gun and threatening to “blow up the federal building,” Sergeant Brad Johnson of the Long Beach Police Department (LBPD) told the Post. 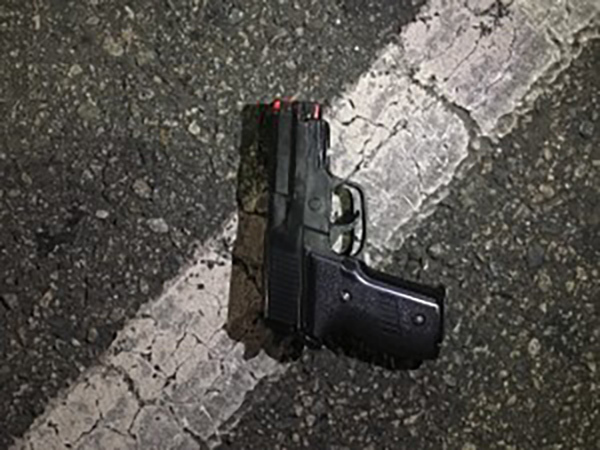 The vehicle was identified as a white Chevy Van, which officers found parked on the 300 block of West Ocean Boulevard, where officers found the suspect armed with a handgun. LBPD’s SWAT team and negotiators were activated at that point. Due to threats allegedly made by the suspect and reported by his wife, the Los Angeles County Sheriff’s Department Explosives Detail was also on scene. Officers handled the incident as a barricaded suspect situation, Johnson said. Officers repeatedly attempted to get the man to drop his gun over the course of the standoff, which lasted over two hours. 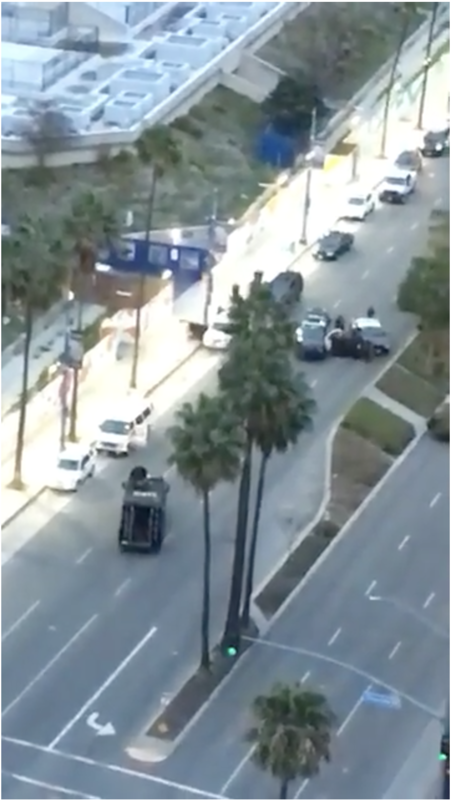 Gunshots can be heard in this clip the from the Long Beach Post’s live stream of the incident, before law enforcement officers are seen approaching the suspect’s position, and then loading the suspect into an ambulance. Full videos below. At approximately 6:00PM, an officer-involved shooting occurred. Multiple gunshots were heard, and police and SWAT forces were seen advancing toward the suspect’s position. A K-9 unit was also deployed. The suspect was then seen being loaded into an ambulance. He was taken to a local hospital by the Long Beach Fire Department, according to police. What prompted to officers to shoot after the protracted standoff, how many officers discharged their weapons, whether the suspect discharged his, or whether law enforcement or the suspect shot first is not known at this time. The suspect’s motives are under investigation by homicide detectives, according to Johnson. The investigation will include interviewing the suspect’s wife, who originally reported the situation to the police, Johnson said. It is not known at this time if explosives were found at the scene, and the investigation by the bomb squad is ongoing. The suspect’s condition has not been confirmed but the shooting is believed at this time to have been lethal. His identity has not been released. No officers were injured during the incident, according to police. At the time of publication, Ocean Boulevard remains closed both east and west bound from Magnolia to Pacific Avenue. Police have surrounded a suspect with a gun on Ocean outside City Hall. More information as it becomes available. Avoid the area.